Monday – Green Chile and Chicken Enchilada with Beans and Rice. 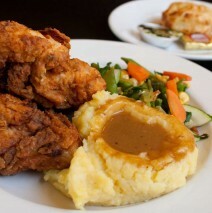 Tuesday – Buttermilk -marinated Fried Chicken with mashed potatoes, biscuit and today’s vegetable. Wednesday – Joe’s Meatloaf with mashed potatoes and today’s vegetable. (Gluten free). Thursday – BBQ Beef Brisket with mashed potatoes and today’s vegetable (Gluten free). Friday – Fish & Chips, Atlantic cod in beer batter with French fries and cole slaw.